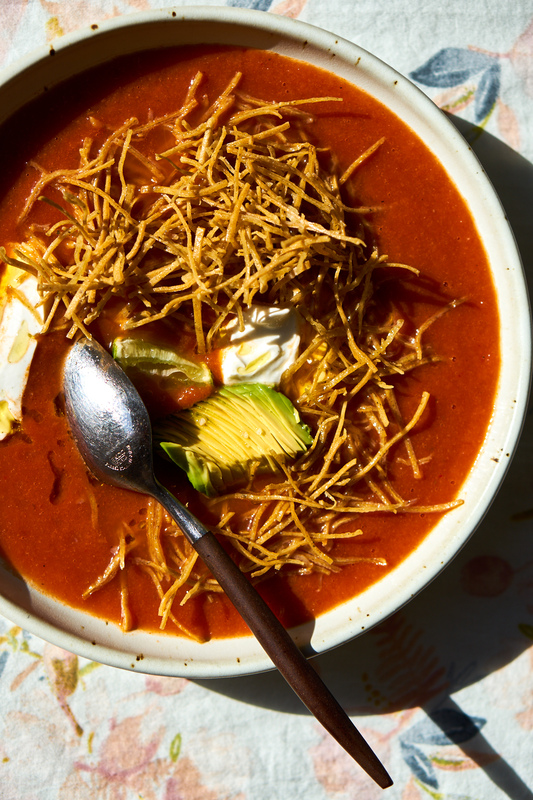 This is my take on tortilla soup - a full-bodied, spicy vegetarian broth envelops a nest of baked tortilla matchsticks. Many tortilla soup recipes call for egregious amounts of shredded cheese, but I've found that a bit crumbled goat cheese or greek yogurt lends just the right amount of creaminess, without throwing everything entirely out of whack nutritionally. And you can take the toppings in a number of tasty directions. There are a thousand ways you can remix this recipe based on your personal preferences or what looks good at your local markets. If I'm after a one dish meal, I'll add some grilled (or smoked) tofu, or a poached egg. If I feel I need greens as well, I'll toss in some shredded chard or spinach. For a more typical take you might (instead) finish the soup with sliced avocado and/or cilantro, chopped white onions, and a squeeze of lime. 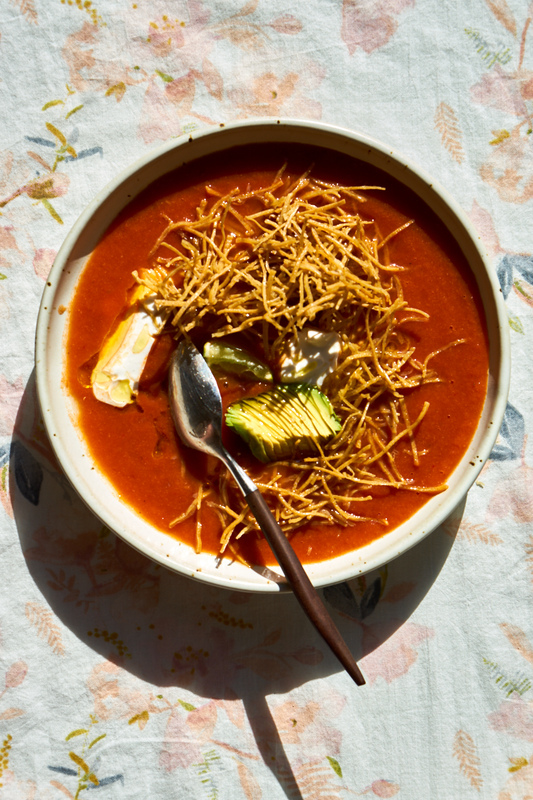 This is clearly what happens when a tortilla soup meets a California pantry - you can either flare it out with salted yogurt, sliced avocado, and a squeeze of lime (above). Or take it in another direction altogether, and top the soup with cherry tomatoes and crumbled goat cheese (below). That being said, I'm hoping my remix will inspire you to try you own using whatever ingredients you might be inspired by. Use the broth as your base and play around from there. As I mention up above, if I'm treating this like a one bowl meal, I'll toss in some tofu (smoked or browned in a skillet) and some shredded chard as well. Heat alert: I call for 1 teaspoon of spicy red chili powder at the beginning of this recipe - keep in mind that some chile powders are stronger than others. 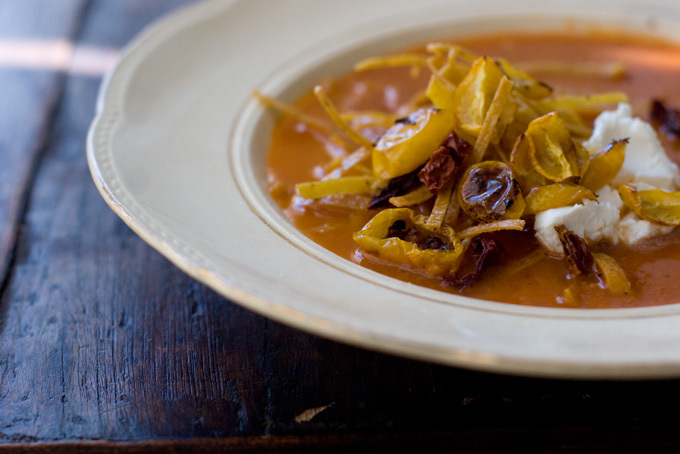 If you (or your family) are worried about the soup being too spicy, scale back. The worst thing you can do is make the soup too spicy too early in the process. If you start out light, you'll be able to adjust the amount of spiciness toward the end. If you like your soup spicier, add more chile powder toward the end. One last note, this is another soup where seasoning is so important. If you haven't seasoned it properly with salt, it is going to taste very flat. Gently toss the tortilla strips with a glug of olive oil and salt. Turn them out onto a baking sheet, arrange them across the pan and bake in a 350F degree oven for 10 minutes or until golden and crispy. Set aside. For the soup itself - in a big pot over medium-high heat cook the garlic and onions in another splash of olive oil along with a couple pinches of salt for just a minute or so. Stir in all the spices and then the tomatoes. Cook down for about five minutes or so, it should thicken a bit. Remove from heat, add one cup of the broth and puree with a hand blender (or puree in a traditional blender). Add the remaining 5 cups of broth and puree until smooth. Bring the soup back up to a simmer and cook for another 10 minutes. Serve the individual bowls topped with either of the topping options: plenty of tortilla strips, the roasted and sun-dried tomatoes, and some crumbled goat cheese. Or, alternately, as I mention above, you can finish with sliced avocado, a big squeeze of lime, and a dollop of lightly salted Greek yogurt. *Roasted tomatoes: Halve (or quarter) a basket of cherry tomatoes lengthwise and put them in a small roasting pan, oven proof dish, or rimmed baking sheet. Toss with a bit of olive oil and a pinch or two of brown sugar and salt. Bake in a 350F degree oven for 40-45 minutes (less time if you use smaller cherry tomatoes), or until the tomatoes are shrunken and golden around the edges. The tomatoes keep nicely in a jar for days (refrigerated), so you can do this part in advance if you like. Set aside. Taco Soup, a weeknight winner. A hearty melding of beans, and corn, and taco spices, and quinoa. Finished with avocado and pepitas and a squeeze of lime. A collection of the easiest dinners in one list. The ones that are super weeknight-friendly. The ones with reasonable ingredient lists. The ones that are simple and delicious. A simple tomato soup recipe inspired by a Melissa Clark recipe - pureed, warmly spiced, and perfect topped with everything from toasted almonds and herbs, to coconut cream or a poached egg.